I received a cutting of Hoya phuwuaensis from Aleagarden in Thailand in July of 2015. It rooted fairly easily, and I grew it under artificial lighting in a warm and humid grow tent. After rooting it, I had many stops and starts with the plant over the next several months. This phenomena is not out of the usual for me and can usually be traced to my heavy handed watering regime. Finally in March of 2016 the plant put on a peduncle, which excited me greatly, and made me watch the plant carefully every day from that point on. After growing a long thread like peduncle, it began to bud up very quickly and flowered in early April of 2016. It then flowered again on the same peduncle and then grew a second peduncle and flowered on that one as well. After all of the flowering the plant has been just sitting there for months having quit growing, but now in the late fall of 2016 it is showing signs of life once again with a new peduncle and a couple of new leaves. Hoya sp. Phu Wua has been kicking around the world of Hoyas now for around five years and has only recently been renamed Hoya phuwuaensis. It was discovered in Phu Wua Wildlife Sanctuary, Bueng Kan Province, northeastern Thailand. 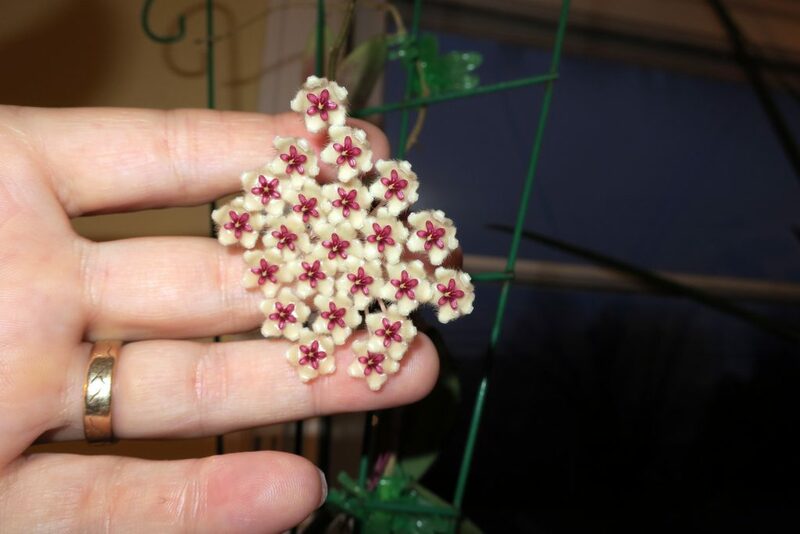 The flowers are very similar to Hoya caudata and Hoya flagellata but the plant seems to be far easier to grow than either of those two plants. I think that this Hoya is a good way to start working your way up to those far more demanding plants and is equally as rewarding to flower. I give Hoya phuwuaensis my highest recommendation!